Are you looking for a way to celebrate Valentine's Day with little cost, but still meaning? If you are like us, we LOVE crafts in our home, and for Valentine's Day, we decided to make sweetheart hands. First, you will need some paint. 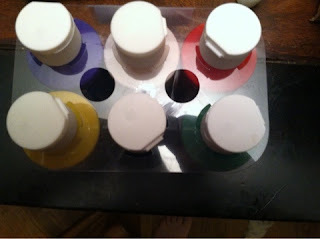 We used Rich Art Paints from our review HERE. 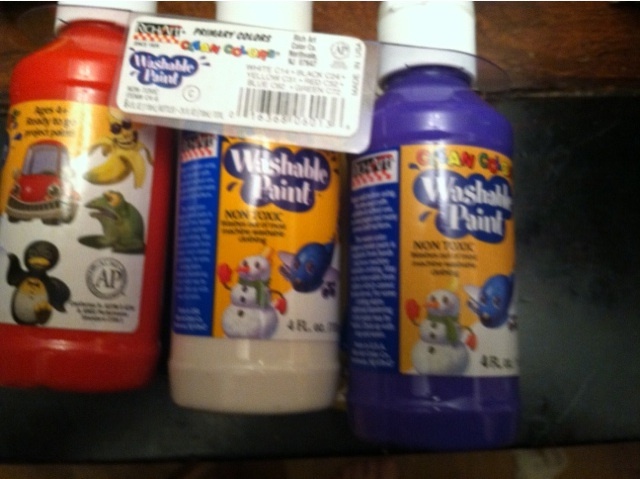 We used the washable paint, and I let each child pick their color. The great thing about Rich Art is that the bottles are smaller and the tops easily flip up, which makes it easier for a child to use. My youngest chose orange, so we mixed red and yellow. 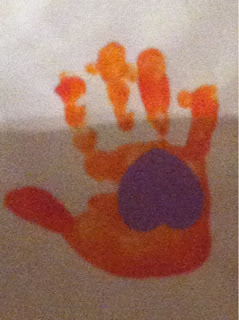 And here is the secret--- do NOT let the child dip their hand in the paint. Take a paint brush and lightly brush their hand with the paint. This gets a nice, bright (and not as messy) print. What is great is you can do hand prints, feet prints, really anything, and it is so easy to wash off! I then let each child choose a heart color and let them paste it on to their hand when they were done. They can write a message on this heart (if they can write), which is a beautiful gift! The heart is meant to go right side up, but my toddler got a little carried away. I place the picture in a frame, and you can even write the date. It makes a great gift for that special sweetheart on Valentine's Day! Want to win some art products to make it easier? Enter below for some fabulous items from Rich Art Color! I love to make paper hearts. I would love to try the glow in the dark glitter glue. I like to make cards. I like to create Valentine cards! we love to make homemade valentines, with tons of little details! From rich art, I love the extra bright neon paint! yeah glow in the dark glitter glue sounds amazing!! I'd love to try the Fun Painter Markers! Thanks! I love to make homemade Valentines for Valentine's Day! Thanks! We would love to try the Quick Painter Tempera Markers! I enjoy making Valentine collection items. Things such as mailboxes, baskets, pouches, and bags that you put all your valentines in. Box to hold Valentine cards. Glitter hearts ! LOL . I love to make homemade sweets! The washable paint would probably be best for my toddler. I like making chocolate pancakes -- if you consider that a craft. I'd like to try the low in the dark glitter glue. We like to make boxes for the school valentines. I'd like to try the Glow in the Dark Glitter Glue. We make cards and pair those with homemade cookies. I like the glow glue :-) Thanks for the giveaway. I love making cookies with my daughter for any holiday. GLOW IN THE DARK GLITTER GLUE looks fun! I most like scrapbooking for V-Day. The washable glitter glue is something I would love to try. We make valentines for everyone. I like the glitter glue. Bits & pieces washable glitter glue. Thanks! My kids each make a Valentine craft of some kind for each grandma. They have fun coming up with new ideas each year! This year my daughter and I have made loads of glittery hearts! Bits and Pieces Washable Glitter Glue looks fun! I like to bake something delicious. I like to make cards and a sweet cake! For Valentine's Day I like to make Valentine Card Collection Boxes. My dad used to help me when I was in elementary school. Great memories. kristiedonelson(at)gmail(dot)com Thank you. 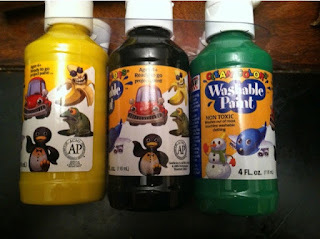 I would like to try the Fun Paint Washable Glitter Glue the most. Yay glitter!! kristiedonelson(at)gmail(dot)com Thank you. I still like making home made Valentines Day cards with glue, paint and glitter. I would like to try the Glow in The Dark Glitter! i love thier pump paint, that such a good idea! We like making Valentine's Cards. This year we made ones and included goldfish. I like the fun painter markers. We would love to try the glow in the dark glitter glue. Sounds like a great combo!! I would love to try the Fun Paint Washable Glitter Glue! Heart cookies and homemade cards. The glow in the dark glitter would be so fun! I like to make homemade valentines with my boys. Glow in the Dark Glitter Glue. I love making our own Valentine Cards. I would like to try their Fun Painter Markers. I like making a few homemade Valentine's cards. MUST try the glow in the dark glitter glue. How cool is that??? I like to make cards and cookies.Thank you for the cool giveaway! My 2 neices would love the Neon paint and the glow glitter also.